An—abruptly elegant—personal appeal hidden in the middle of a bureaucratic record, a record covering the various minutiae of one regiment of the vast British military apparatus but containing no information (other than a name) about the man who had chronicled them all. What on earth was it doing here? 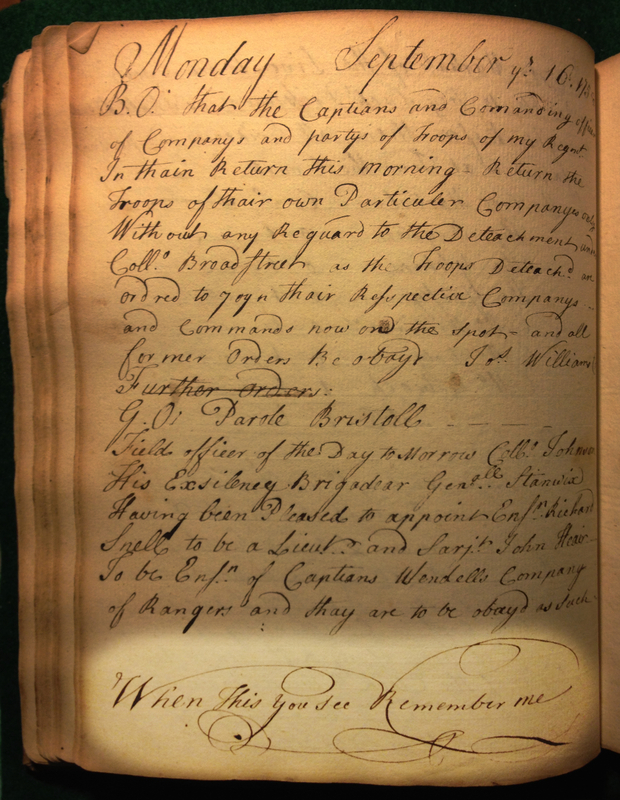 This post began as a simple question about the meaning of private voices in the state record and quickly became something a little more meandering—tracing a phrase, finding its ubiquity in the British Atlantic, and then, in that broader context, pondering how and why it came to be on the page of an official military document. “When this you see, remember me.” For me, the first thought I had was of Gertrude Stein, who had used the line in more than one of her poems. But the chronology seemed just a bit off. A quick google search confirmed my sneaking suspicion that the phrase was a good deal older—dating back to at least the medieval period. Out of my depth, I decided I’d scramble forward again to the early modern era and see where else I could find that line. It turns out it was everywhere. When Land is Gone and Money Spent / Then Larning is most excellent. / If this you See / Remember Me. Josiah DuBois is my name, America is my Nation, New Paltz is my dwelling place and Christ is my Salvation. When I am dead and in my grave and all my bones are rotten, when this you see remember me that I am not forgotten. And finally, back to where I began: Decorating the bottom of a middle page of a military orderly book kept by Sargent Amariah Preston of Captain David White’s company of Colonel Joseph Williams’s regiment from August to October 1758. What do we make of pervasiveness, of the very same line marking a powder horn, a children’s book, a diary, a love token, a vase, furniture, and a government record? What does it mean for those same words to have been penned and stitched and etched by bored schoolchildren, professional military officers, young men in love, and many others? Cultural ubiquity seems to both reaffirm and undercut its meaning: the line could be a reflection of a commonly held hope, of a belief that one’s legacy could be preserved in the written word. Yet the line could also be so common, so reflexive, as to be used almost completely unthinkingly. Most of the instances of this forget-me-not were personal: imprinted on objects held by individuals and given to others known. But the orderly book stands out precisely because it was produced not for or to honor any individual, but for the use and record of a government institution. Moreover: what is the significance that the line was on a page written just a day after large numbers of troops departed for a major expedition against French Fort Frontenac? Was the line not only about remembrance for those who set off into such uncertainty—even though the author wasn’t even amongst those going—but also about nostalgia? Especially considering its regular use by children, could the line be about purposefully invoking childhood? Home? A universal sentiment? The type of document or object has to matter to some extent. Read in the context of other contemporary orderly books, the inscription by Preston was all the more atypical. The majority of off-topic scrawls in similar records were stray calculations or hasty scribbles on extra last pages. This was something far more conscious and—evident in the baroque handwriting—far more elaborate. So what was the intent, the purpose of leaving it here, in an official record of the military? And what does a bureaucratic forget-me-not tell us about authorship and the relationship of agents and the state? In constructing the paperwork of the state, Amariah Preston helped build the state—he helped grow a military apparatus just beginning to tighten its grasp on North America. He helped build a more regular, more regulated imperial institution. He helped standardize an army that would soon win a war that would have drastic consequences for the fate of North America. The questions of intentionality and authorship are messy. The theoretical categories of the state and of state agents and of culture and of society equally difficult to delineate. And with the simple inclusion of a short forget-me-not, Preston’s order book becomes caught in the tangle. But on page 51, Preston took an orderly book and made it, for at least a small sliver of a sheet, a personal document. Or at least that’s how I’d like to read it. Fort Stanwix orderly book, Manuscripts and Archives Division, The New York Public Library. Alice Morse Earle, Child Life in Colonial Times, 124-125. [“The History of Little Goody Two-Shoes,” Proceedings of the American Antiquarian Society, Vol. 49 (1939), 351. Appendix B: Cyphering Books Held by the Huguenot Historical Society, Rewriting the History of School Mathematics in North America 1607-1861, 185. Femke Molekamp, Women and the Bible in Early Modern England: Religious Reading and Writing. Coin, halfpenny size: Variety: Pandora’s Breeches #256. O. A pair of Breeches full of Combustibles on Fire, underneath a Head… with a Sword through the Neck, and part of a Serpent with tis Sting broke off, “Pandora’s Breeches.” R: An Anchor between Hearts, a Crown at top, “When this you see remember me.” James Conder, An arrangement of provincial coins, tokens, and medalets, issued in Great Britain, Ireland, and the colonies, within the last twenty years; from the farthing, to the penny size. (Ipswich : printed and sold by George Jermyn. Sold also by T. Conder, No. 30, Bucklersbury; and H. Young, No 10, Tavistock Street, London, 1798.) ECCO. “Jonathan Prown pointed out to me a white pine and poplar desk, Norfolk, Virginia, ca. 1790-1820, Colonial Williamsburg, G1988-427, with a succesison of female names inside the lid and the pencilled phrase, “If you see remember me.”” [Footnote 44, page 272, “Hannah Barnard’s Cupboard: Female Property and Identity in Eighteenth-Century New England,” Laurel Thatcher Ulrich, Through a Glass Darkly: Reflections on personal Identity in Early America, Eds. Ronald Hoffman, Mechal Sobel, Fredrika J. Teute (Chapel Hill, NC: University of North Carolina Press, 1997). Stephen V. Grancsay] American Engraved Powdr Horns: A Study Based on the J. H. Grenville Gilbert…, 38-39. English delft – presentation pieces: “Joseph Swadell. / When you this see remember me / And bear me in your mind / Let all the world say that they will / Speak of me as you find. –1774.” Louis Marc Solon, The Art of the Old English Potter, 116. Sarah Richards, Eighteenth-century Ceramics: Products for a Civilised Society 54. Undated British Love Token. […] Reverse: Keep This As a Token of Love And Gratitude From Your Unfortunate Friend When This You See, Remember Me, and Bear Me In Your Mind And When I You My Liberty To You Will Prove Kind And Well Wisher And Unfortunate Friend I love…” HNAI Medals and Tokens Long Beach Auction Catalog #1100, 137.